Like most teachers, you may be looking for a way to increase your students’ interest in math. While English and reading may prove to be more naturally entertaining, math often gets stuck in the ‘boring’ or ‘hard’ categories. However, by introducing cool math games into your lesson plans you can take math from boring to blast off! Math lends itself naturally to the use of games during teaching. The endless variety of number combinations as well as the ability to incorporate different math functions such as addition, subtraction, multiplication, and division, gives students a chance to practice and play at the same time. Using games to help reinforce math concepts also engages students who might otherwise resist this subject. To create a true attention-grabber, introduce math games by Gynzy throughout your lessons by using your interactive whiteboard. Teach a concept then use a game to review them before moving on to the next section. This will not only help your students practice what they’ve just learned, it will also help them stay tuned-in throughout the lesson since they’ll never be sure when another game will surface! Since math games can also be adapted depending on the level of each student, they make excellent practice activities for the entire class. One set of students can be working on addition while another group can move on to their subtraction skills. This concept holds true for upper grade mathematics as well. Whether your class is working on long division or basic algebra, there is a math game that can help reinforce the concepts, strengthen number skills, increase student confidence, and make learning fun. Keep reading for six math games that will spark the love of math in your class! Playing shopping or grocery store style games is always an engaging way to teach your class about money. Most students love to feel that they are making big decisions by paying for items all on their own. Help students know when to pay with bills versus when to pay with coins with the interactive whiteboard Paying with Money activity. In this educational game, a picture of a relatable item, such as fruit, will be displayed at the top of the screen. The price of the item will be shown beneath the picture. Along the bottom of the screen, students are given a number of coins and bills to choose from which they will use to pay for the item. 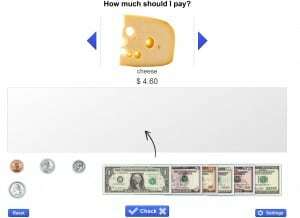 They select the form of currency they feel is best and ‘pay’ for the item shown. The ‘Check’ button allows students to see if they are correct while the ‘Retry’ button gives them a chance to try again. Since the range and value of the money as well as the products ‘for sale’ can be altered, this activity gives teachers a chance to change the difficulty level depending on the skill of the student(s). Students love the challenge of trying to find a match whether they’re playing on their own or as a class. The Create Your Own Memory Game for your smartboard allows you to custom design a memory game for your class. Select the ‘Settings’ button to begin creating your game then give your memory match a title. Now use numbers and math functions to design your custom matching game. For example, create one card that says ‘2 x 4=’ and then another card that says ‘8.’ Students find a match by discovering the correct equation and answer combination. This same pattern can be used for addition, subtraction, and division as well as for fractions, decimals, basic algebra, and greater-than/less-than concepts. Just make sure when you’re creating your game that there is only one correct answer per equation. Students can play in pairs, on their own, or in groups and can be arranged based on skill level. This game makes a great reinforcement activity, math center activity, or quiet game when other work has been completed. Use this fun favorite to reinforce math concepts you’ve been teaching throughout your lesson. Using your interactive whiteboard, select the ‘numbers’ option for the setting. For this game, don’t let the students see the projected image of your whiteboard so that you can provide them with a basic equation to solve before they place their markers. On your smartboard, press the ‘Play’ button to draw a number. When the number comes up on your screen, give the students a simple equation they have to answer in order to find the number. For example, if the number that comes up on your board is 18, you can tell your students to find the answer to 9 + 9. Give the class a moment to solve the problem before going over the answer. This technique can also be used for other math functions or for more complicated equations. Since the math bingo game also gives you the option of playing in two teams or as an entire class, you can further customize this activity for skill level, competitive play, or simply for fun reinforcement. 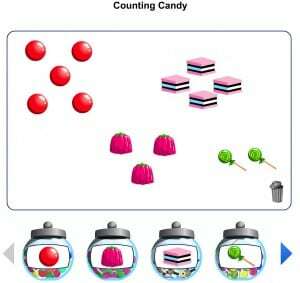 Though Counting with Candy can be an excellent interactive whiteboard tool for Preschool and Kindergarten classrooms, it also works well for upper grades that are working on more complex math concepts. Higher grades can use this tool to solidify understanding of subtraction, addition, multiplication, and division concepts. Choose the types of candy you’d like to work with then drag the candy from the candy jar onto the screen. If you’re working with addition problems such as 4 + 3, drag four pieces of candy onto one side of the screen then ask your class to add three more. Wait to see if they can come up with the answer, then drag three more pieces of candy onto the screen and count the whole together. This game not only works well to reinforce concepts, it’s also a great way to introduce the skill. Use the candy to show how 4 + 3 are added and why the answer is 7. Since this tool can be used either by a single student or with the entire class, it can also be customized based on need and skill level. The Gynzy interactive whiteboard Tic Tac Toe game is another great way to reinforce math concepts during or after your lessons. Display the game on your projector and split the class into two groups. Assign one group the ‘X’ and the other group the ‘O.’ Put a math problem on the board; whichever team first answers it correctly gets to play first. To begin play, place another math problem on the board and give the first team a chance to solve it. You can even set a timer to ensure they have to answer at a specific point. If the team solves the problem correctly, they get to choose which space they want their letter to go on. If they answer incorrectly, the other team gets a chance to solve it correctly and can place their own letter in the square instead. This game allows students to play in a fun, competitive atmosphere and helps motivate them to want to answer the question correctly. It also keeps both teams engaged the entire time since the other team can ‘steal’ a question if the first team answers it wrong. Turn the smartboard Algebraic Expressions tool into a fun math game where students play relay style on two or more teams. Divide your class into teams. 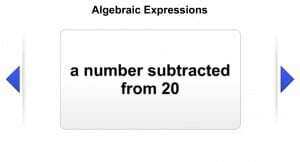 Use the Algebraic Expressions tool on your interactive smartboard to display a new phrase. Then, using the classroom whiteboard or large pieces of butcher paper taped to the wall, have one student from each team race to the front of the room and translate the expression from word phrases into numbers. Whichever team’s representative writes the answer correctly first scores a point. For example, if the expression on your smartboard says “the product of a number and 5,” students must race to correctly write a version of 5x. Whichever team has the most points at the end of the game wins. This fun and interactive game is great for higher grades that are working on algebra concepts and word problems. The competitive nature helps create the motivation and attention required to learn the necessary concepts. Regardless of which activities you choose to incorporate into your lessons, using a educational games to help teaching math functions will increase your student’s participation and comprehension. In addition to the games listed above, the Gynzy website provides dozens of other math activities that will reinforce topics that range from fractions and denominators to graphing and coordinates. Help your students take math off the boring list and start using your interactive whiteboard to foster their interest and retention. Encourage parents to use Gynzy tools at home so that your students can practice their math skills in non-traditional homework assignments as well. We also recommend the great resources of Digipuzzle : a wealth of mathematics and learning games for kids that your children can play from your own home. By incorporating games into your lesson plans, you may find that math has suddenly become your class’s favorite subject!